Small to medium business owners can enjoy the latest RAID technology at affordable prices and low power consumption with the Dell PowerEdge RAID Controller (PERC) H330. Ideal for file, web, database and email servers, the PERC H330 delivers trusted Dell PERC reliability with minimal maintenance effort. 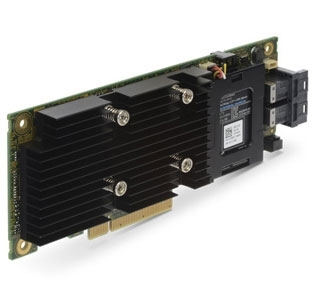 The PERC H330 entry-level controller card offers a straightforward solution that includes essential RAID levels and support for non-RAID (passthrough) configuration options. In addition, the card connects to SATA and SAS hard disk drives, and solid state drives, allowing for tiered storage that optimizes cost and performance. Physical disk power management (Dimmer Switchâ„¢) technology provides additional cost savings by managing power consumption for idle, unconfigured and configured drives. Dellâ€™s entry-level RAID controllers cover the spectrum of tiered storage requirements for cost-sensitive applications that require robust data protection.